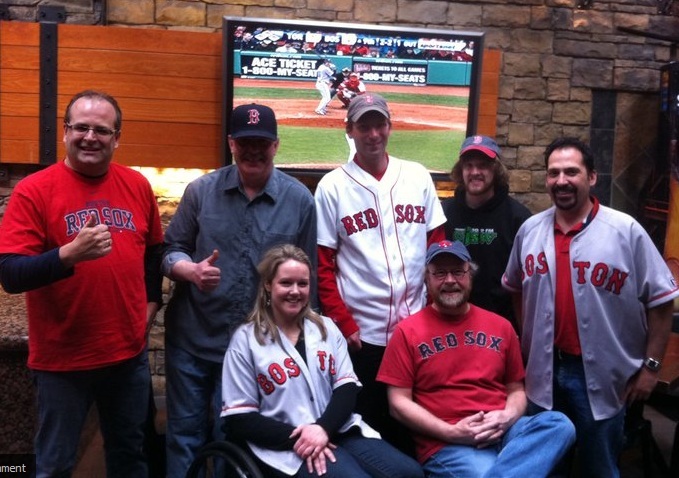 Last year, the governor of Red Sox Nation Alberta hosted a total of 6 Red Sox watch parties right here in Calgary. Below is a recap of these 6 games, to show you what you were missing if you didn't make it out to these. This year's schedule has been posted, so please come on out and cheer our Red Sox on. The first watch party was on April 16th against the Blue Jays, and this was the FIRST EVER INTERNATIONAL RED SOX NATION event! That game came when we were still in the middle of a disastrous start, our record being 2-10 at the time. In the first inning we scored 2 runs before the Blue Jays recorded an out, and that was all we would need as Josh Beckett pitched 7 strong innings, only giving up 3 hits, and we won 4-1. This was the game that started our 81-42 run that lasted until the end of August. (I've conveniently tried to forget what happened after Labour Day). The next watch party was on May 14th in New York, against the always hated Yankees. Boston had clawed its way back up to near .500 (19-20) and Beckett was on the mound again, against Yankee ace CC Sabathia. Both pitchers started well, Boston only managing 1 hit until the 5th inning, when Ellsbury knocked in 2 runs with a bases loaded double. Again, that was all Boston would need, as neither Beckett nor the bullpen gave up any runs, and Boston added 4 more runs against CC in the 7th inning, as the last pitch he threw resulted in an Adrian Gonzalez 3 run blast. The win also narrowed the Yankees lead to just 2 games over Boston with another game left to play in the weekend series, and showed that we could not only beat their ace, but embarrass him. The following month the watch party featured the Blue Jays again as the Red Sox flew north of the border for a series in Toronto. This game was a bit of a laugher. In the 3rd inning, after a run had already crossed the plate, Toronto intentionally walked David Ortiz to face Jed Lowrie. It's almost never a good idea to issue an intentional walk - it never makes sense in the 3rd inning, and Jed continued his early season heroics by willing himself to get hit by a pitch and knock in another run. By the time the inning ended 4 runs had scored. In the 4th inning we added another run, but the game broke wide open in the 5th when we scored a converted touchdown, aided by 3 run shots from Varitek and Ortiz. Lackey only made it through 6 innings, but by the time he left we had a commanding 13-4 lead. Before the game ended the Blue Jays had middle infielder Mike McCoy on the mound, and as he held Boston scoreless Toronto was probably thinking he should have started the game as Boston ended up with a 16-4 victory. (footnote: The next day many fans across Canada were calling for another Mike McCoy appearance, as Toronto hurlers didn't fare any better giving up 14 runs as Boston won it's season high 9th game in a row). In July Boston travelled to Tampa for another Lackey start. It looked like Boston's RSN watch party streak would come to an end as Tampa scored 3 runs on 4 hits and an error while only recording a single out in the bottom of the 1st. Luckily a double play ground ball halted the damage before the game got away from us. Reddick then hit a 2 run home run in the 2nd inning and we had a close ball game again. In the 3rd frame back to back doubles after a single and walk knocked in 3 more runs, and we were in the lead. Lackey couldn't make it through the 6th inning, but left with a 6-4 lead, and our bullpen closed it out as we won easily 9-5. August's watch party had us facing the still hated Yankees. We got to face CC again, while 1 game behind in the standings, but this time we had Lackey on the mound instead of Beckett, so fans could be excused for not being too optimistic for a positive outcome. Boston opened the scoring with a pair in the 3rd inning, but in the top of the 4th Red Sox fans were screaming at Lackey as he loaded up the bases without retiring a runner. A double play helped mitigate the damage, but the Yankees managed to tie it up. But the period of time that we didn't have the lead was short lived, as we scored 2 quick runs in our half of the frame, and then Ellsbury hit a 3 run home run off of CC making it a 7-2 game. As poor a performance as Sabathia had in the first RSN watch party, being charged with all 6 Boston runs, this performance was even worse as he ended up getting tagged with 7 runs in his 6 innings of work. Again, Lackey wasn't going to be confused with Cy Young, but he pitched well enough giving up just 3 runs over his 6 innings, as Boston won 10-4. The final watch party of the season was on September 13th as we hosted our Canadian competition from Toronto. Boston had lost 5 games in a row and 9 of the past 11, so badly needed a win. With 2 outs in the 1st inning, it looked like fate was on our side, as a hit by a pitch and error led directly to 2 unearned runs and Boston had an early lead. But Wakefield was a bit shaky, and he gave up 3 runs in the 2nd inning and 2 more in the 3rd. We started the 6th inning clinging to a 6-5 lead, but aided by a Dustin Pedroia 3 run home run, we scored 4 times to take a commanding 10-5 lead. But our bats weren't done, as we scored 7 times in the 8th inning to walk away with an 18-6 victory. In summary, we went 6-0 in the watch parties. We beat Yankee ace CC Sabathia twice, and had 2 innings where we scored 7 runs against the Blue Jays. We stopped a couple of losing streaks won some laughers, and had some good come from behind wins. But most importantly we all had fun watching baseball surrounded by other baseball fans!